I've been going through my scrap room and trying to purge some supplies I haven't used in a while. It's a pretty cathartic experience, I tell ya! But I must admit, 15 years of scrapping supplies is DEFINITELY hard to sift through. And the Virgo-hoarder in me is always asking myself, "Wait, I might need that someday " or "Wait, I might USE that someday." *sigh* But I figure, if I haven't used it in over a year, looked at it in over 2 years, or even forgot I ever had it, I probably won't use it, right? Yup, that's what I keep having to tell myself. I took a couple of Amy Tan's classes a while back and she's always saying, yes, you may love your products and want to hoard it all, but what good is all that stuff if you don't USE it? Rub-ons don't rub anymore. Thickers lose their tackiness. Glue dries up. So, USE it all and love what you use it on. So I used some of the extra goodies from one of her classes, added it to the Hambly (the bicycle paper) I picked up at their warehouse closing sale, included some Thickers I had in my stash (they weren't sticky anymore so I had to use glue dots! ), and even misted a bit with some of my Tattered Angels mists. Voila, I have a page! Oh and I'm all sorts of in love with Kerri Bradford's Storyboards and other picture templates. She's totally revolutionizing my scrapbooking world. 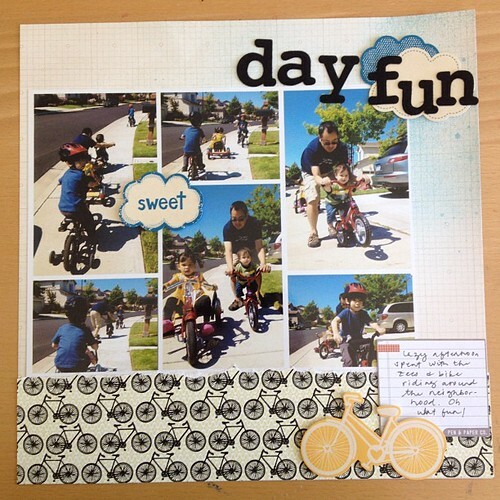 I can still create a one page layout but add multiple pictures without the guesswork. Super awesomesauce. More layouts like this to come.